here are countless exercises using just the weight of your own body as resistance... and there are many ways to classify these exercises. For simplicity sake, and for the purpose of the progressive training programs to come, I have divided the exercises into the categories of Basic, Intermediate and Advanced. 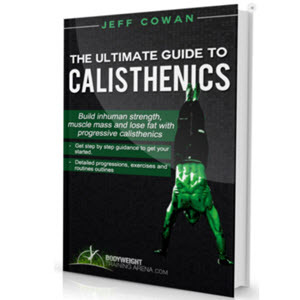 Each category is divided further into Upper Body, Trunk, Lower Body and Calisthenics. To simplify matters more, each exercise will be assigned a combination of letters and numbers, as well as the name, for easy reference. For example, BU#1 Yes Neck Nods means Basic Upper Body Exercise #1, Yes Neck Nods. This simple classifying system will come in handy when looking for exercise descriptions in the book, designing your own workout programs and tracking your progress. therefore, I do not recommend doing extremely high reps of any exercise. To increase over-all repetition numbers and continue to progress... increase the number of sets or circuits you perform instead. Therefore, after each exercise name you will see a recommended max reps per set number. For example, BU#1 Yes Neck Nods (MRPS 20) means Basic Upper Body Exercise #1, Yes Neck Nods, Max Reps per Set 20. This will become clearer when I describe the workout progression systems in detail later in the book. While I believe these numbers to be reasonable... you may need to increase or decrease this number depending on your personal goals, needs, abilities and limitations. If you're wanting to learn about fitness... Then this may be the most important letter you'll ever read! You Are Going To Get An In-Depth Look At One Of The Most Remarkable Fitness Guides There Is Available On The Market Today It doesn't matter if you are just for the first time looking at a healthier choice for your life, this fitness guide will get you on the right track to staying healthy.